Whey, a by-product of cheese and curd manufacturing, was once considered a waste product. The discovery of whey as a functional food with nutritional applications elevated whey to a co-product in the manufacturing of cheese. The components of whey include beta-lactoglobulin, alpha-lactalbumin, bovine serum albumin, lactoferrin, immunoglobulin s, lactoperoxidase enzymes, glycomacropeptides, lactose, and minerals. Whey is a popular dietary protein supplement purported to provide antimicrobial activity, immune modulation, improved muscle strength and body composition, and to prevent cardiovascular disease and osteoporosis. Hepatitis Whey protein supplementation demonstrates variable effects in patients infected with Hepatitis B or C.
Human Immunodeficiency Virus (HIV) Glutathione deficiency is a common problem for individuals infected with HIV. Study shows that Glutathione levels increased within a two-week period after whey protein supplemtation. Antimicrobial Several studies have revealed lactoferrin plays a direct role in the body’s defense against pathogens, including findings that individuals more susceptible to infection have lower levels of neutrophil lactoferrin. Gastrointestinal Support Whey protein has demonstrated a protective effect on the gastric mucosa. This effect is thought to be related to the sulfhydryl component, particularly cysteine and its link with glutamic acid in the production of glutathione. Osteoporosis Milk has been proposed as a nutritional food that aids in the prevention of osteoporosis due to its bioavailable calcium content. In a study, the authors state 400-800 mL of milk is equivalent to the 40 mg dose of MBP (milk basic protein). Results indicate a daily dose of 40 mg per day of MBP significantly increases radial bone density. Note: Most whey proteins are processed to remove lactose and finished whey products only contain trace amounts. Whey, a protein complex derived from milk, is being touted as a functional food with a number of health benefits. A number of clinical trials have successfully been performed using whey in the treatment of cancer, HIV, hepatitis B, cardiovascular disease, osteoporosis, and as an antimicrobial agent. 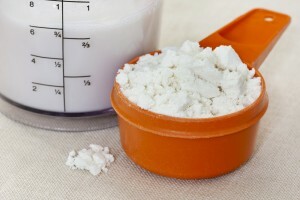 Whey protein has also exhibited benefit in the arena of exercise performance and enhancement.